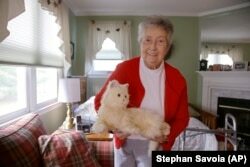 Mary Derr, 93, sits on her bed and talks to her robot cat she calls "Buddy" in her home she shares with her daughter Jeanne Elliott in South Kingstown, Rhode Island. Imagine a cat that does not need someone to clean up after it, keeps an older person company and helps them remember to take their medicine. That is the shared dream of the toy maker Hasbro and scientists at Brown University in Providence, Rhode Island. The researchers received a $3-million-dollar award from the National Science Foundation for a special project. The goal of the project is to find ways to add artificial intelligence, or A.I., to Hasbro’s “Joy for All” robotic cat. The cat has already been for sale for two years. It is aimed at older people and meant to act as a “companion” for them. It makes the same noises as a real cat and even appears to seek attention from its owners. The Brown-Hasbro project is aimed at developing additional abilities for the cat. The team includes researchers from Brown’s medical school, local hospitals and a designer at the University of Cincinnati. Researchers at Brown’s Humanity-Centered Robotics Initiative are working to decide which activities older adults may need the most help with. Such activities include finding lost objects and reminding the person to take medicine or visit their doctor. Bertram Malle is a professor of cognitive, linguistic and psychological sciences at Brown. He said that the researchers do not want to make unrealistic promises of what the cat can do. He said he and his partner Michael Littman, a computer science professor, hope to make the cat perform a small number of activities very well. They also want to keep the cost down to just a few hundred dollars. Hasbro’s current “Joy for All” cat costs $100. They have given the project a name that follows that idea: Affordable Robotic Intelligence for Elderly Support, or ARIES. It is an idea that has appeal to Jeanne Elliott. Her 93-year-old mother Mary Derr lives with her in South Kingstown, Rhode Island. Derr has dementia. The Joy for All cat that Elliott bought this year has become a true companion for Derr. The robot cat stays with Derr and keeps her calm while Elliot is at work. Derr treats it like a real cat, even though she knows it is electronic. Mary Derr, 93, with her robot cat she calls "Buddy" in her home she shares with her daughter Jeanne Elliott in South Kingstown, Rhode Island. Elliot told the Associated Press her mother often forgets things. She added that a cat that helps her mother to remember to take her medicine and be careful when she walks would be great. Diane Feeney Mahoney is a professor at the Massachusetts General Hospital’s Institute of Health Professions School of Nursing. She has studied technology for older people. She said the project shows promise because of the team of researchers. She called the cat a tool that could make things easier for someone caring for a person with middle-stage dementia. It could also be useful in elder care homes that do not permit people bring in real animals, she said. But she hopes the researchers involve people from the Alzheimer’s community. “We just don’t want to push technology for technology’s sake,” she said. The scientists are studying how people feel about the robot cats, as well as the everyday lives of elderly people. They are also trying to learn how the improved cats would complete helpful activities and how they would communicate that information. Littman said they do not want a talking cat, however. “Cats don’t generally talk to you,” he said. Instead they are looking at whether the cat could move its head in a special way to successfully communicate its message, for example. In the end, they hope to create an exchange between the human and the cat in which the human feels the cat needs them. By doing so, the researchers hope they can even help prevent feelings of loneliness and sadness among elderly people. I’m Lucija Milonig. And I’m Pete Musto. Michelle R. Smith reported this story for the Associated Press. Pete Musto adapted it for VOA Learning English. Ashley Thompson was the editor. What other kinds of technology do you think might help with mental and physical illnesses? We want to hear from you. Write to us in the Comments Section or on our Facebook page.